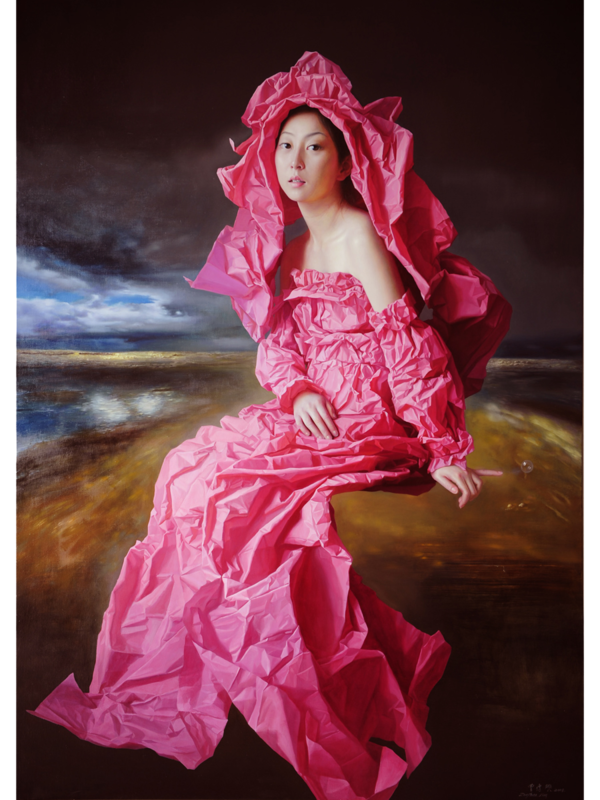 Zeng Chuanxing was born in Longchang County, Sichuan Province, in 1974. He majored in oil painting at the Central University for Nationalities from 1995 to 1998. His realist paintings depict young, beautiful girls and women reflect a return to classicism and a subtle, yet poignant commentary to modern day China. While the majority of his artist contemporaries have explored and implemented more contemporary modes of expression, Zeng turn to a traditional way to express his modern ideas. The classical skills not only clearly convey his own feelings, but, almost more importantly, to serve as a window to understanding other people’s feelings, thoughts and emotions. Zeng pays particular attention to his characters’ eyes and hands, as he maintains it is with these parts of the exterior body that a human being’s soul can vividly and truly be reflected. About his ongoing series of Paper Bride, Zeng was enlightened by one of his “successful in business but unlucky in love” female friend. Zeng comments on the fragility and uncertainty of marriage. In old times, Chinese marriage was strictly assigned. The possibility of divorce was none and even the thought of end a relationship was considered criminal. Marriage was like a gambling, you never know what you are going to get. As social progressing, women are free to choose and change their spouse, but still vulnerable in marriage. Zeng’s quiet and melodic figures, draped in delicate paper gowns, represent the fragility of this once impenetrable bond and reflect the often melancholic and insecure state he sees in the new generation of Chinese women. In this particular work only, the wedding dress was shaped like a fishtail, plus the bubble near her finger, all these elements make the girl looks like a mermaid just finished her transformation near the sea on a rock worrying about herself and the prince. Hopefully this time it will be a happy ending version of The Little Mermaid.